Remember the past Bull-Luterman trades (see A Corkscrew Trade and Luterman Trade II)? And now here's Trade III. Did anyone get screwed this time? Or was it an even trade? You be the judge. 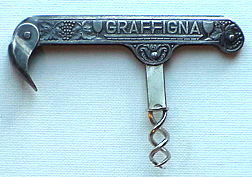 The first thing Bull offered to Luterman in this deal is this rare double helix corkscrew with advertising "Graffigna / Centenario." This unusual decorative corkscrew is a celebration of one hundred years of a winery in Argentina. Bull had assembled a collection of rare corkscrews from Argentina. In a moment of great generosity he offered Luterman the pick of the litter for trade bartering. Luterman picked the cream of the crop. 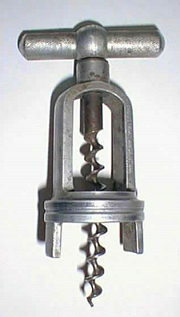 This rare corkscrew is marked INDUSTRIA ARGENTINA and has bottle guides at the bottom of the frame. 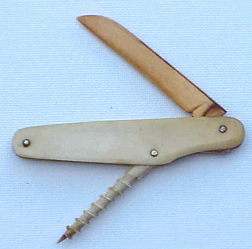 While Bull was viewing corkscrews* at Luterman house , Luterman suggested this ivory fruit knife as trade bait for the above two corkscrews. Although it is an interesting work, the ivory worm would be of little help in extracting a tight cork from a bottle of fine Argentinean wine. Nevertheless, Bull accepted it pending the addition of something else to equalize the trade. *The viewing included many rare corkscrews that Bull had given up in previous trades. Bull led Luterman to several showcases in the house and suggested trade material. Sadly, Luterman could not find his way to part with any of them - still crying about needing the two rare Argentinean corkscrews for his collection. Finally Luterman pointed out that he had two non working Syroco Old Codger clocks. Out of desperation, Bull reluctantly accepted it in consumation of the trade. It could be placed on his shelf next to his Syroco Waiter clock. These are short, fat versions of the Old Codger and Waiter corkscrews. 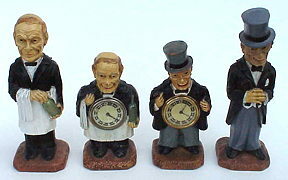 Has anyone seen any of the other Syroco figures as a clock? So the deal was done - September 8, 1999! What do you think? Email your opinion to corkscrew@bullworks.net or leave your opinion in the guestbook. Refer to LUTEBULL TRADE III and indicate A, B or C.
Bob Roger: Lute wins again! But not by much. Bull is gaining. Mike Smith: Definitely A - None of Bull's will open wine.